2007 Nissan Navara to end Toyota/Isuzu dominance? Proton is not the only Malaysian carmaker to have its sights set on a slice of the Thai market, and now a new budget brand, Naza, is available in Thailand. 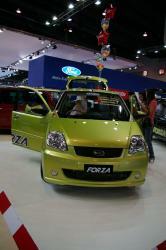 Naza presented the Forza model, and the car was very well received, with over 500 orders placed at the motor show. The Naza Forza is built in Malaysia and imported and sold via the Yontrakit Group, through their Yontrakit Motor Sales Co. Ltd. unit, and will be alongside Kia models at the 34 Yontrakit Kia dealerships throughout Thailand. 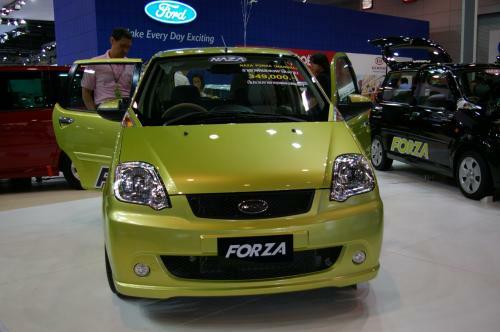 Priced at THB 349,000, the Naza Forza is the cheapest new car available in Thailand. This should change next year with the introduction of Ecocars, but until then, the Forza gives us an idea of what we can expect. For one thing, the popularity of the Forza indicates that there are plenty of potential buyers out there that are looking for a cheap set of wheels. According to Sathit Techalarpamnuay, the managing director of Yontrakit Motor Sales, the company distributing the Naza, the company had hoped for 200 orders at the show. The fact that orders exceeded 500 units should serve as an indication that the demand for cheap cars may be underestimated. This car is cheap! There is a reason it costs THB 349,000. The reason: because it is cheap. Okay, I don't want to be over critical of a car that is priced so low, so I'll include some positives. And there are some good things to be said of the Forza. 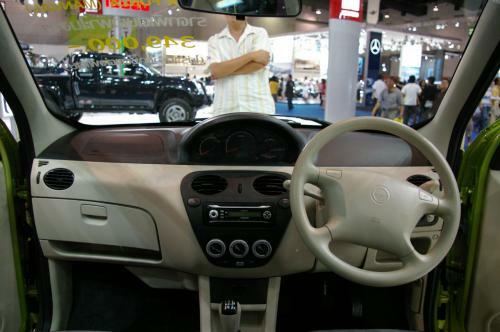 First, the design is quite nice for a car in this segment. And it should be, as the design is from Pininfarina, the Italian design house responsible for some of the worlds most beautiful car designs. That said, this is not among them, but look at the placement of the front indicator lights. Overall the design is nice, and the interior is also quite neat, although sparse, as you would expect for the money. Compared to the competition... oh, wait... there is none. So I suppose we have to give the Pininfarina design a positive plug. 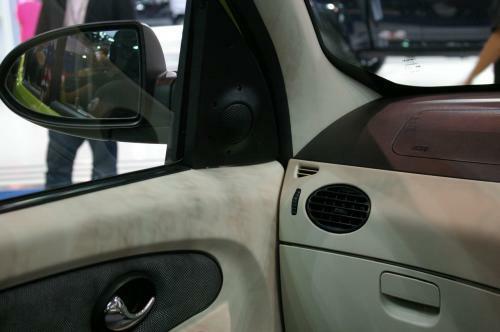 Another notable positive is that it includes both driver and passenger airbags. Or at least, there are SRS airbag logos that suggest this is the case. Full marks to Naza here. Remember the THB 709,000 Toyota Altis doesn't have airbags at all, not one! In fact you have to spend THB 814,000 before you have airbags fitted to your Altis. The THB 550,000 Honda Jazz also lacks airbags, and you have to shell out THB 640,000 for the V (AS) model to enjoy what should be a standard feature. Having said that, I'm sure I'd rather crash in a Altis than in a Forza, airbags or not. 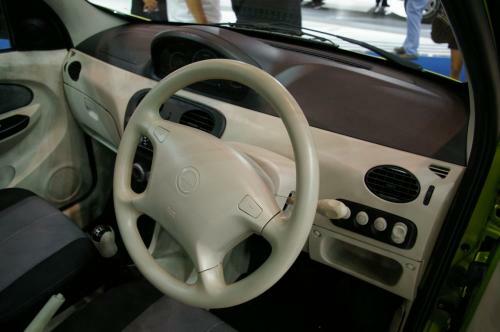 A car this small, doesn't offer the same confidence in a crash, but the airbags might help a little. Space is not bad either. Again, you have to remember that this is a small, cheap car. It is suitable for work as a city runabout though, and will easily do the same job as a Toyota Yaris costing twice the price!! But, being cheap is fine, feeling cheap and acting cheap is another matter. The build quality looks and feels awful. Gaps in the seams, horrible feel to everything, the list goes on. Then there is the driving position. Now, I know I'm not the average buyer for this car as most of them will be young Thai girls getting their first car, but I hope they have more luck finding a driving position that works for them. I'm around 185 cm tall, and I couldn't find a way to be far enough from the pedals, while keeping the gear leaver in reach, unless sitting very upright. 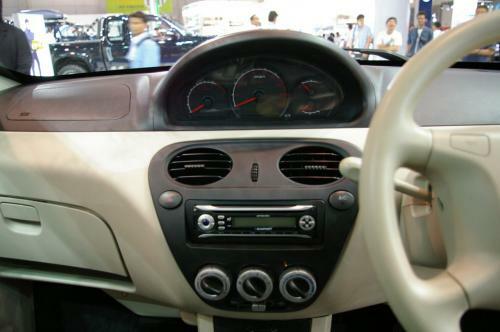 The engine is a 1.1 litre unit, mated to a 5-speed manual box. This will not be popular with the aforementioned target market of young Thai girls. They are going to stall at traffic lights all over Bangkok, so be ready for that if you see one in front of you. Not much to tell about the engine. Producing 64hp, the engine won't offer much in the way of excitement, or refinement, but it should be economical enough. These small engines are new to Thailand, where motorists are spoiled with 1.5 litre 100 hp+ units in their VIos, Yaris, Jazz. Time will tell if the market can adjust to these smaller units. I have to mention this. You know the way all cars have a redline on the rev counter to indicate when you are exceeding the safe limitations for the engine? Well, the Forza is the first car that I've ever notice to have a red line on the speedometer as well! From 130 km/h onwards, the segmented white speed scale line changes to red. Perhaps Naza is suggesting that it's best kept below that speed! The Forza is being marketed with the idea that it is built from an asortment of various "world-class" technologies. As mentioned before the design is from Italian company, Pininfarina, the suspension is claimed to be from Lotus (or proton? ), and then there is the astounding fact that the electronic fuel system if from Bosch of Germany. Hmm... please write in and let me know what cars don't use Bosch fuel systems. I'm more interested in knowing which world-class crash test it has been subjected to, and how did it perform. Naza Forza at Motor Show gallery.